A native onion, with a nodding umble of bright rosy-pink flowers atop 10-15” stems in late spring through mid summer. Grows best in very well drained soil in full sun. If happy, it may self seed and colonize, creating quite a stunning display over time. Mostly animal resistant; some grazing may occur. One of the showiest, with large purple balls atop four to five foot tall stems. Unlike other large types (A. altissiumum, A.‘Globemaster’), A. giganteum needs excellent drainage year-round for optimum performance. Flowering time is late spring, from mid May through June; however, seasonal interest begins with stem emergence in mid April through the dried flowers in July. Full sun. Mostly animal resistant; some grazing may occur. 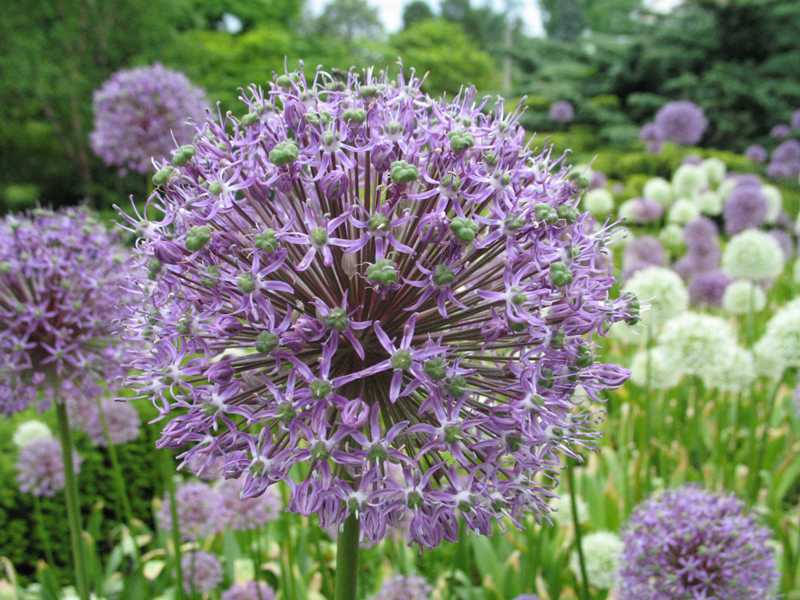 An excellent allium for the rockery or rock garden; not as tolerant of heavy or moist soils as other types. ‘Jeanine’ is one of the best selections available; otherwise, the generic mixtures usually available are fine. Terrific addition to the herb garden or perennial border. Foliage is strongly aromatic and piquantly flavored. Thrives in well draining but moist soil in full sun; can become invasive if allowed to go to seed. Season of bloom is summer; plant maintains its presence from mid-spring through late fall. Mostly animal resistant; some grazing may occur. 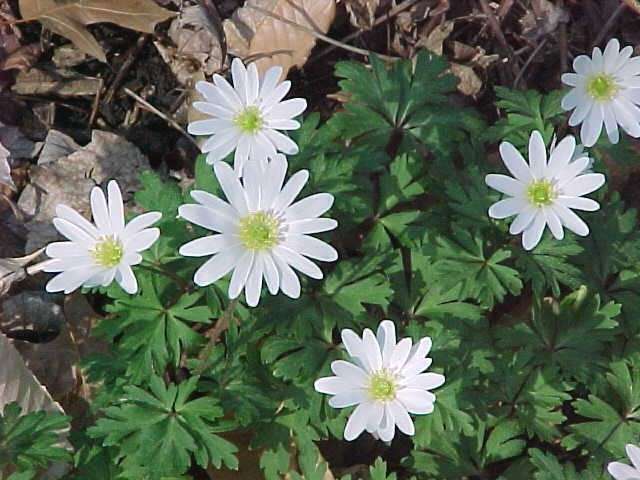 Anemone blanda hybrids are the best of the bulbous anemones for our region. They prefer full sun light shade, rich soil, and adequate moisture throughout while in growth—spring woodland conditions are excellent. A tip for success: soak bulbs in lukewarm water for up to two days prior to planting, changing the water twice daily. This ensures the bulbs will have enough absorbed moisture to promote healthier root development. Mostly animal resistant; some grazing may occur. 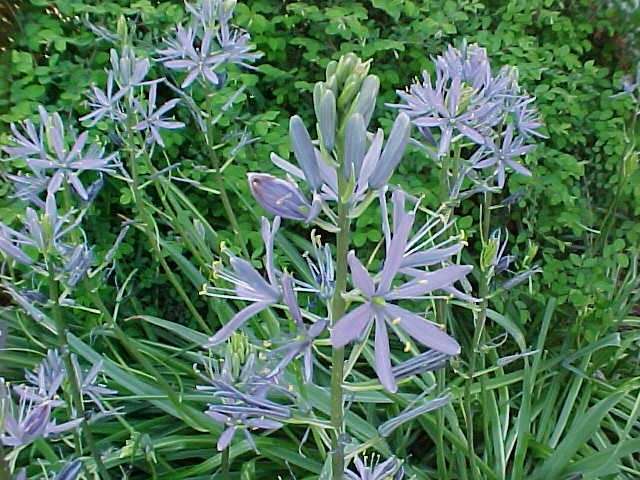 A really beautiful perennial plant for a moist, organic, lightly shaded area. Pink, white, and now striated flower forms available; also available with variegated foliage. 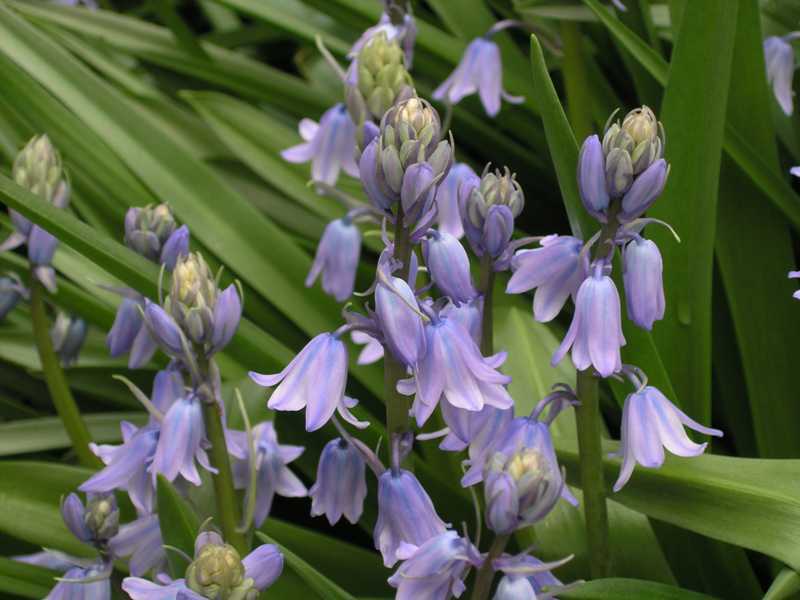 Excellent for a moist woodland or shade garden. It may take a year or two to establish, and should be left alone thereafter. This non-hardy summer bulb really adds color and tropical flair to the summer garden. Shade is its preferred site--even in the heaviest of shade where little else will grow--though many varieties will tolerate full sun just fine. Its one requirement is lots of moisture—being tropical, it loves water, especially in the sun. A plethora of selections makes this a very user-friendly plant. Also a terrific container plant. Must be dug and stored indoors during the winter. The best storage tip: a light dusting of sulphur powder (available at garden centers) following digging will prevent an otherwise troublesome rot issue. An excellent choice for low-lying or excessively moist areas during spring and fall. Tolerates heavy soil, but prefers rich, organic conditions. Grey-blue star-shaped flowers on 2-3’ spikes flower in May. The best of the commercially available selections. For sun to light shade. Animal resistant. This, its hybrid and selected forms, and representatives of C. forbesii are some of the best low-growing, early-flowering very long-term perennial bulbs. Colors are rich blues, whites, and pinks. Very early to early flowering, from mid-late February to early April. Very tolerant of any soil but prefers moist organic soil, in sun or partial shade. Self seeds and increases by bulb very freely, quickly creating a carpet of color anywhere it is planted. Probably the best early bulb display for the money. Animal resistant. Colchicums are one of the best autumn flowering bulbs for our region. 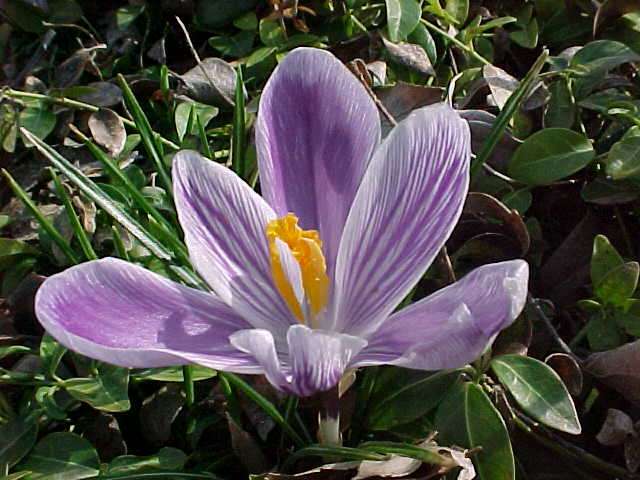 Commonly sold as meadow saffron or autumn crocus, it is neither; instead, it is a unique member of the lily family from which the potent chemical colchicine is derived. 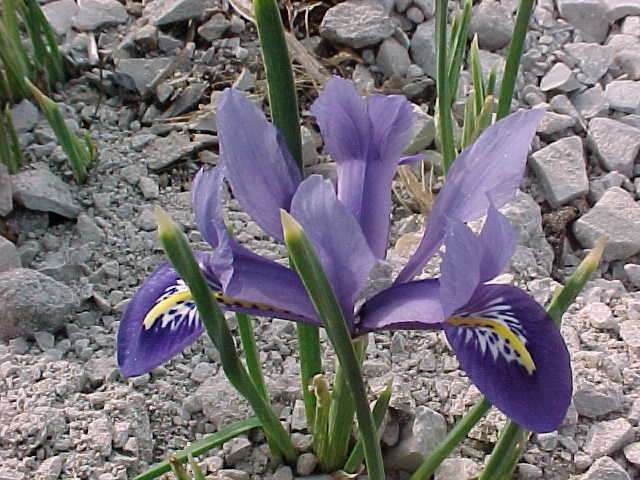 Its beautiful green foliage is present in the spring; during summer the entire plant is dormant; and in the fall, usually starting in mid-September, the crocus or tulip-shaped flowers atop 2-8” leafless stems are borne in profusion, usually with many stems per bulb creating a spectacular clump. ‘Waterlily’ is a double-flowered form, with lilac colored flowers. 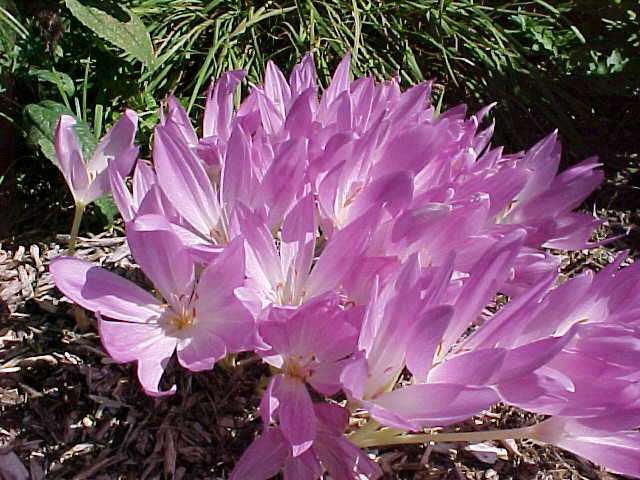 It takes moisture better than most of the Colchicum varieties, and has better flower substance thus holding up well in autumn rains. 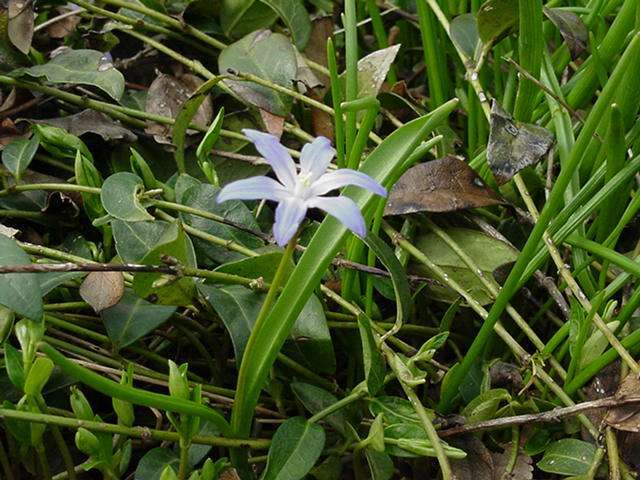 Plant in well-draining soil, in a location that receives sun in the spring, when the foliage is present. Animal resistant. 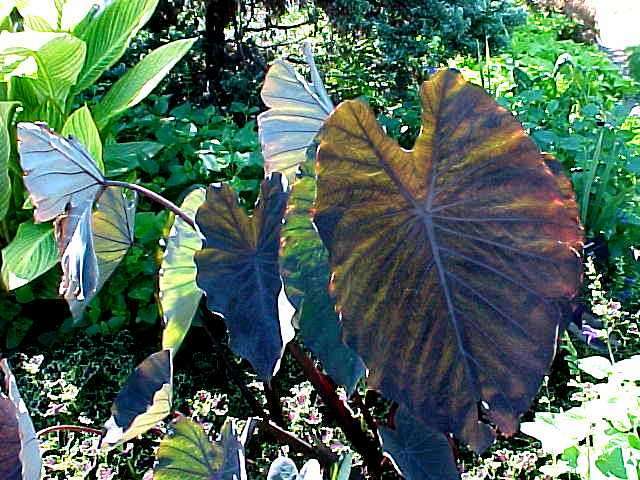 A dark, smoky, purplish-maroon version of the classic green elephant’s ear. Stronger, darker colors in full sun; considerably greener in shade. This, unlike most elephant’s ears, must be kept moist or growing during the winter, or treated as an annual and purchase anew each year. Dig and bring indoors before frost in fall. A unique and beautiful hardy South African bulb for the late summer garden. It is, however, very particular with soil requirements; it must be grown in exceptionally well-drained gritty soil, and must be kept very dry during their dormancy (winter). 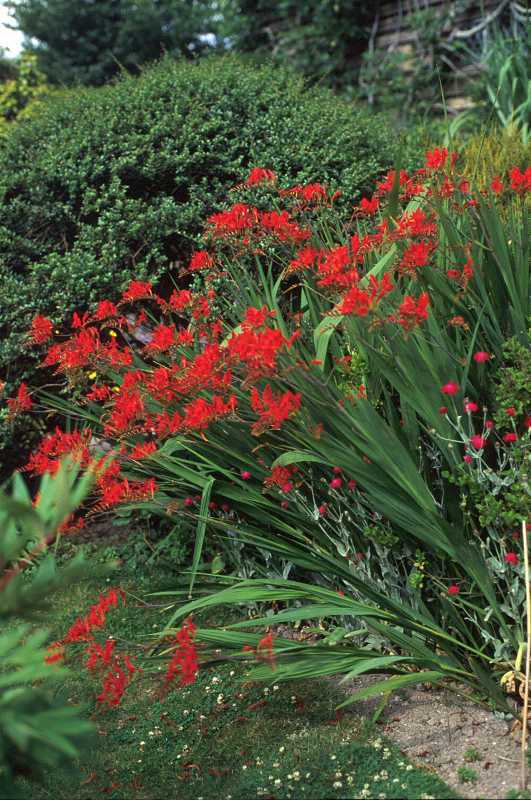 ‘Lucifer’, a 24-30” tall brilliant red-orange variety, is probably the easiest and most to grow of the many available hybrids, yet it too can disappear after a season or two. 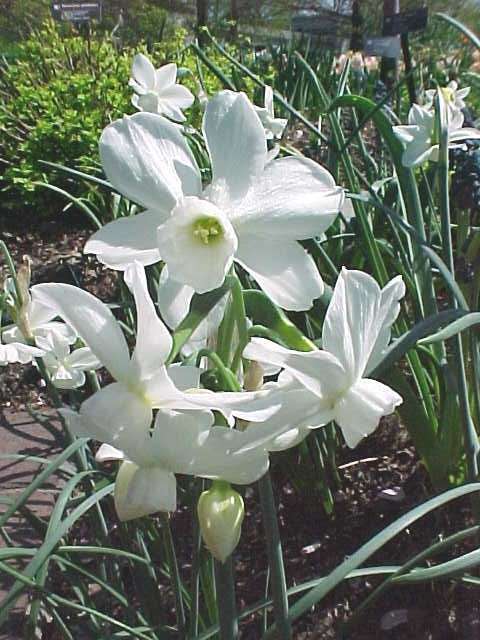 Perhaps best grown as an annual bulb, lifted and stored indoors over winter. One of the truly perennial large-flowering spring crocuses. Large violet-purple striped white flowers in early March. Most crocuses require very well drained soil for continued performance, however this variety tolerates above average moisture without hassle. Full sun, with a summer baking ideal. Unfortunately they are not animal resistant; squirrels, mice, and chipmunks love them. 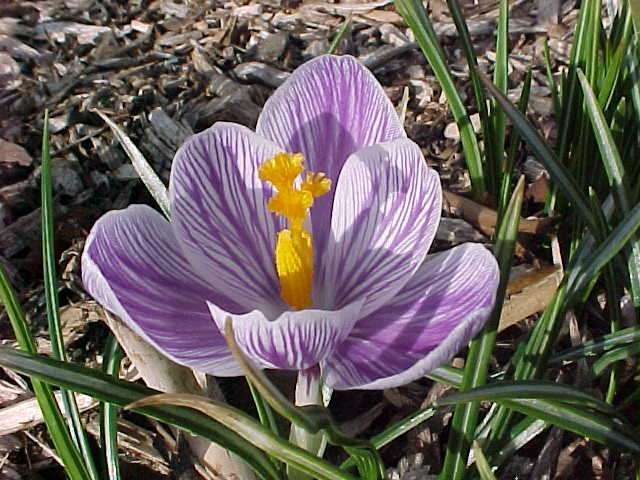 Probably the best perennial large-flowered crocus for Saint Louis. Very rich, deep royal purple flowers. Most crocuses require very well-drained soil for continued performance, however this variety tolerates above average moisture without hassle. Full sun, with a summer baking ideal. Unfortunately they are not animal resistant; squirrels, mice, and chipmunks love them. Often sold as a substitute for ‘Pickwick’; flower striping isn’t as uniform as Pickwick’s, otherwise just as good. Most crocuses require very well drained soil for continued performance, however this variety tolerates above average moisture without hassle. Full sun, with a summer baking ideal. Unfortunately they are not animal resistant; squirrels, mice, and chipmunks love them. New Guinea hen flower, or chequered lily. The best fritillary species for garden use in our region. One foot tall stems with fine foliage bear pendant flowers of pink, white, and maroon, uniquely checkered throughout. Blooms throughout April. For sun or shade, in moist, organic, and ideally alkaline soils. In a woodland or undisturbed situation, it will readily self seed. Animal resistant. 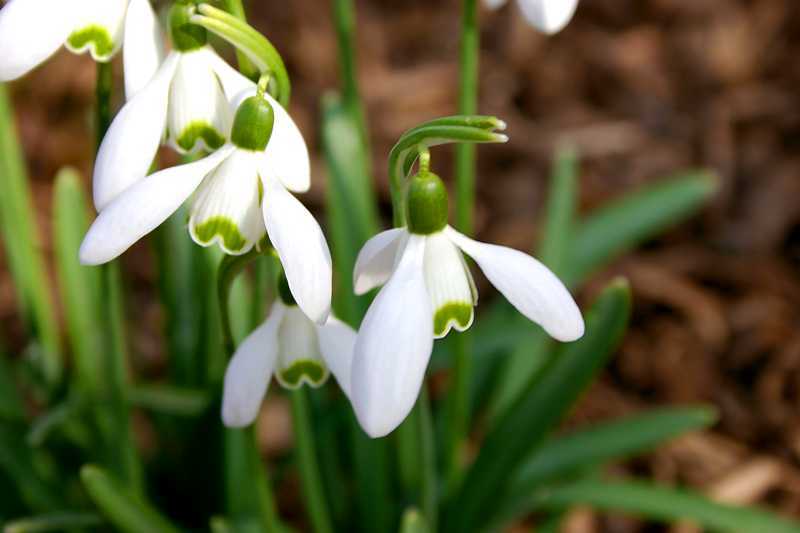 Very early, often flowering in late January to early February. A very long-term perennial with fast increase thus clump appeal. Tolerates a wide range of conditions from moist to dry, year-round, in full sun to partial shade. Is best divided or planted in the garden in spring, while foliage is still present (just after flowering). Excellent companion for later flowering plants. Animal resistant. Without doubt one of the best late spring flowering perennial bulbs. Ten- to twelve-inch spikes of blue-lavender flowers arise in profusion from rosettes of glossy green leaves. For sun or shade, ideally in moist, organic soils. Animal resistant. Plant of Merit. Hardy spider lily, native to SE Missouri. For moist, rich soil in full sun. Extraordinarily fragrant white flowers, up to ten inches across, bloom in late July through mid August on two-and-a-half-foot stems. Though hardy, it may take several years to establish; once established, it should not be disturbed. Foliage begins to emerge in early winter, and should be protected if hard freezes are anticipated. Animal resistant. A gorgeous, non-hardy summer blooming tropical spider lily. Will tolerate any moist soil in full sun. Very large amaryllis-like leaves and husky stems up to three-feet tall. Extremely fragrant white flowers, up to ten to a stem, bloom mid-July. ‘Sulphur Queen’ is a butter-yellow colored form that is just as good. The very large bulbs should be dug in the fall, after the first frost. Animal resistant. One of the few bulbs that tolerates heavy, often wet clay without fuss. 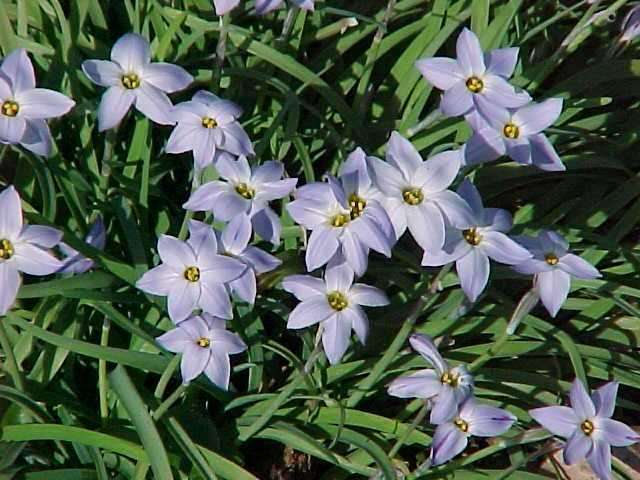 Like Muscari, Ipheion emerges in late summer to early autumn, acting as a terrific indictator plant for other dormant bulbs. 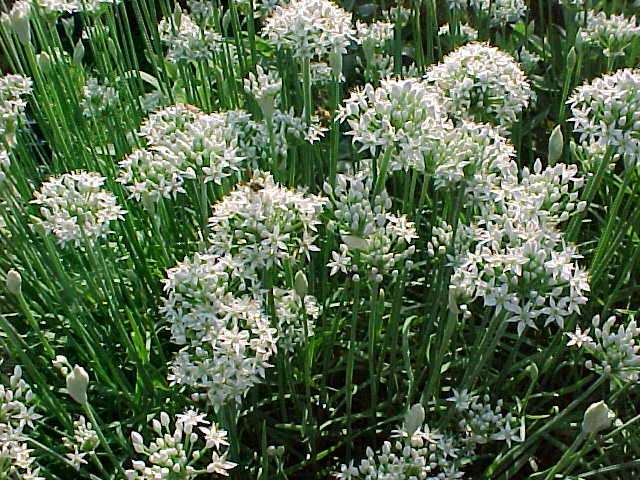 Foliage has very strong scent of onion or garlic if bruised. 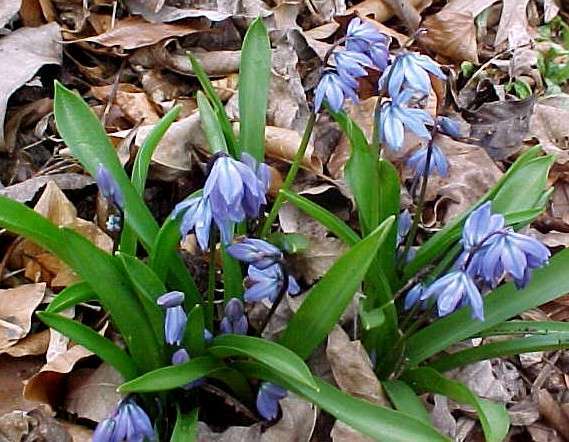 Rich blue flowers bloom in profusion from late March through April. For any soil in sun to light shade. Mostly animal resistant; some grazing may occur. Not a highly recommended plant for the Saint Louis region, unless it can be grown in pots or troughs, dried off completely in summer and given very little water in the winter. 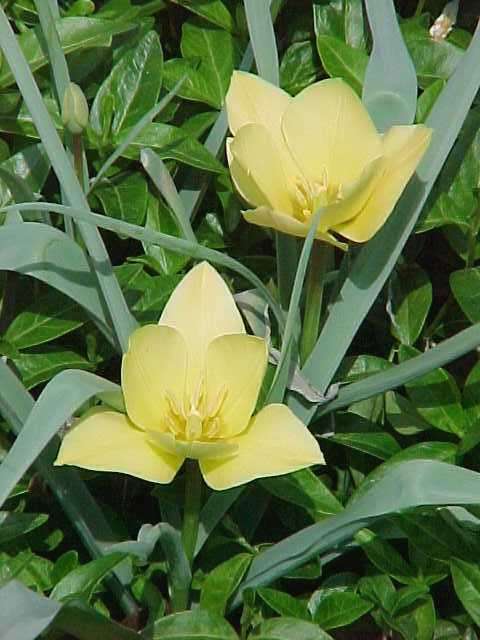 A beautiful golden-yellow flower that can be treated as an annual bulb, as its cost is minimal. Mostly animal resistant, though some grazing may occur. Very early, flowering in late February to March. A long-term perennial in very well-drained sites, otherwise 3-5 years as a short-lived but inexpensive and valuable addition to the garden. Hybrid selections come in very rich blue and violet colors for early spring. Excellent companion bulb for later flowering plants. Mostly animal resistant, though some grazing may occur. One of the best bulbs for our region, for any application. This is one bulb that is not fussy about soil, light or moisture. It is a superb perennial that once planted, can grow for decades undisturbed. 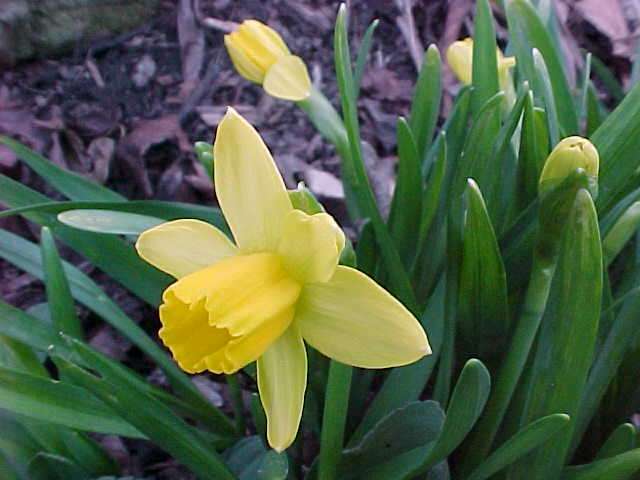 Bulbs, foliage, stems, and buds resemble daffodils; upon opening, multiple pendant flowers per stem open white with green tips. Makes superb cut flowers, too. Animal resistant. A terrific trumpet, ranging from light apricot to strong orange, with maroon striping on the reverse side of the petals. Midseason bloom, usually mid-June. Stems four- to five-feet tall. The heady fragrance of trumpet lilies can easily perfume an entire garden or indoor space with just a few flowers. They typically flower early to midseason, throughout June. They are tall, ranging from three to six feet or more. Each stem may have as many as thirty flowers. Due to their height, staking is recommended as the weight of their flowers can cause their stems to break, especially in windy or rainy conditions. Tip: A small and inconspicuous preliminary indicator stake should be put out when the bulbs are first planted, about six inches away from the bulb. As the stems on the lilies begin to reach several feet, replace the indicator stake with a larger and strong bamboo or steel rod, and loosely tie the lily stem(s) to it in at least three places from the top to the bottom of the stem. By doing this you will reduce the risk of injuring the bulb, which over time can grow to the size of a large cantaloupe. All lilies make excellent companions to daffodils and other earlier spring-flowering bulbs, quickly concealing the spent flowers and foliage as they grow. Full sun in well drained moist soil. Unfortunately, lilies are desirable to animals, especially rabbits and deer. Wonderful trumpet, ranging from light, buttery yellow to deep gold, with maroon striping on the reverse side of the petals. Stems four to five feet tall. The heady fragrance of trumpet lilies can easily perfume an entire garden or indoor space with just a few flowers. They typically flower early-midseason, throughout June. They are tall, ranging from three to six feet or more. Each stem may have as many as thirty flowers. Due to their height, staking is recommended as the weight of their flowers can cause their stems to break, especially in windy or rainy conditions. Tip: A small and inconspicuous preliminary indicator stake should be put out when the bulbs are first planted, about six inches away from the bulb. As the stems on the lilies begin to reach several feet, replace the indicator stake with a larger and strong bamboo or steel rod, and loosely tie the lily stem(s) to it in at least three places from the top to the bottom of the stem. By doing this you will reduce the risk of injuring the bulb, which over time can grow to the size of a large cantaloupe. 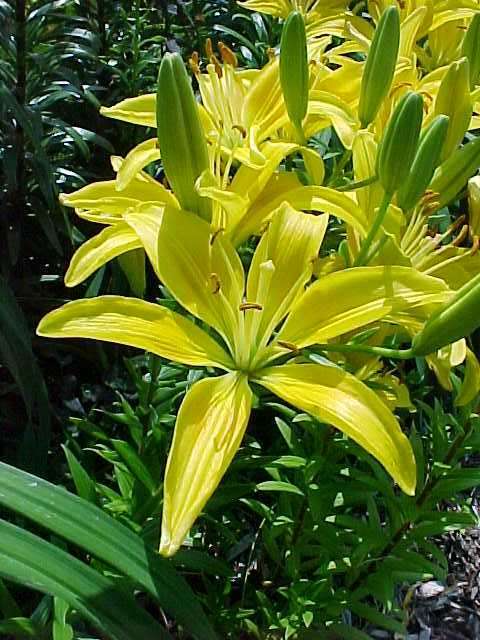 All lilies make excellent companions to daffodils and other earlier spring-flowering bulbs, quickly concealing the spent flowers and foliage as they grow. Full sun in well drained moist soil. 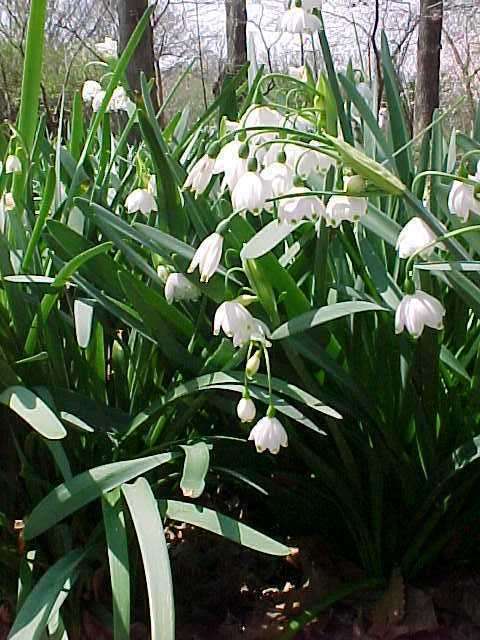 Unfortunately, lilies are desirable to animals, especially rabbits and deer. A very nice lavender-pink trumpet lily for the back of the border. Mid-season bloom, usually mid June. Can grow to over six feet.The heady fragrance of trumpet lilies can easily perfume an entire garden or indoor space with just a few flowers. They typically flower early to midseason, throughout June. They are tall, ranging from three to six feet or more. Each stem may have as many as thirty flowers. Due to their height, staking is recommended as the weight of their flowers can cause their stems to break, especially in windy or rainy conditions. Tip: A small and inconspicuous preliminary indicator stake should be put out when the bulbs are first planted, about six inches away from the bulb. 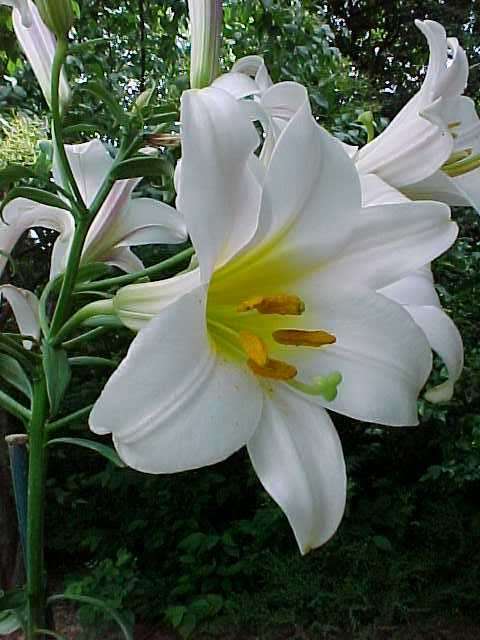 As the stems on the lilies begin to reach several feet, replace the indicator stake with a larger and strong bamboo or steel rod, and loosely tie the lily stem(s) to it in at least three places from the top to the bottom of the stem. By doing this you will reduce the risk of injuring the bulb, which over time can grow to the size of a large cantaloupe. All lilies make excellent companions to daffodils and other earlier spring-flowering bulbs, quickly concealing the spent flowers and foliage as they grow. Full sun in well drained moist soil. Unfortunately, lilies are desirable to animals, especially rabbits and deer. An oriental species lily, noted for its exquisite, spicy fragrance. Late blooming, usually late July. Typical of most oriental lilies in the Midwest, however, it doesn’t like extremes in heat and humidity, preferring a much milder climate. 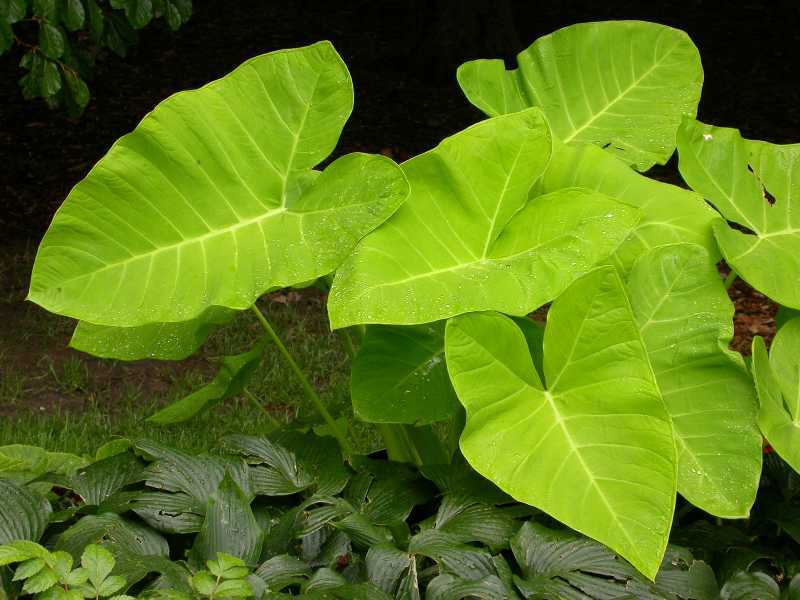 It can be grown successfully for a few years in an area of a garden that stays cooler, has some afternoon shade, and slightly acidic soil conditions. Orientals and orienpets (oriental x trumpet hybrids) typically flower mid-late season, usually mid June through mid-late July. They are tall, ranging from three to six feet or more. Due to their height, staking is recommended as the weight of their flowers can cause their stems to break, especially in windy or rainy conditions. Tip: A small and inconspicuous preliminary indicator stake should be put out when the bulbs are first planted, about six inches away from the bulb. As the stems on the lilies begin to reach several feet, replace the indicator stake with a larger and strong bamboo or steel rod, and loosely tie the lily stem(s) to it in at least three places from the top to the bottom of the stem. By doing this you will reduce the risk of injuring the bulb, which over time can grow to the size of a large cantaloupe. All lilies make excellent companions to daffodils and other earlier spring-flowering bulbs, quickly concealing the spent flowers and foliage as they grow. Full sun in well drained moist soil. 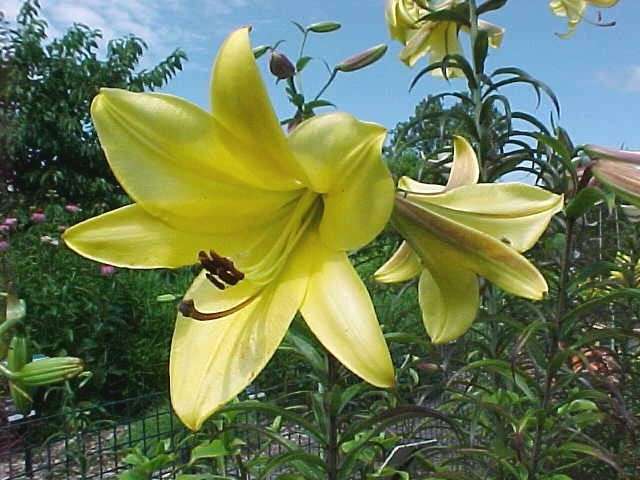 Unfortunately, lilies are desirable to animals, especially rabbits and deer. One of the finest lilies for the garden. 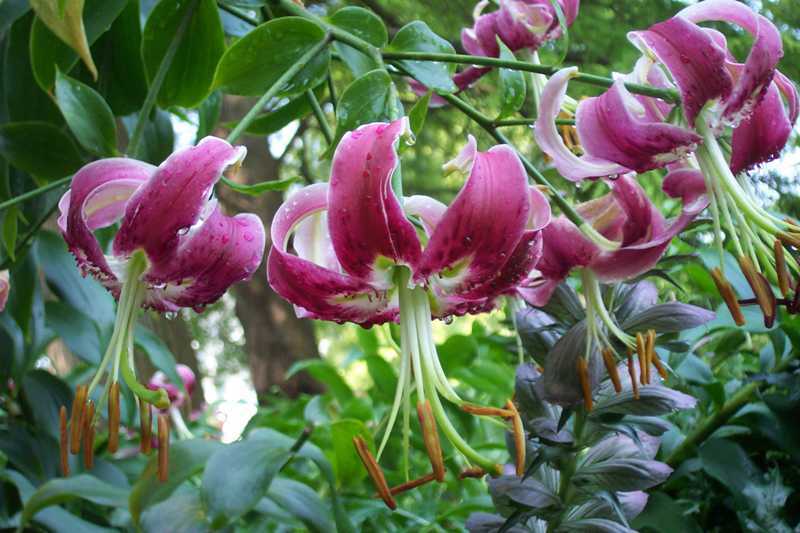 An oriental lily by breeding, but with all of the heat and weather tolerance of trumpets. Flowers, as many as fifty or more to a mature six foot stem, are deep reddish-pink bordered with white. 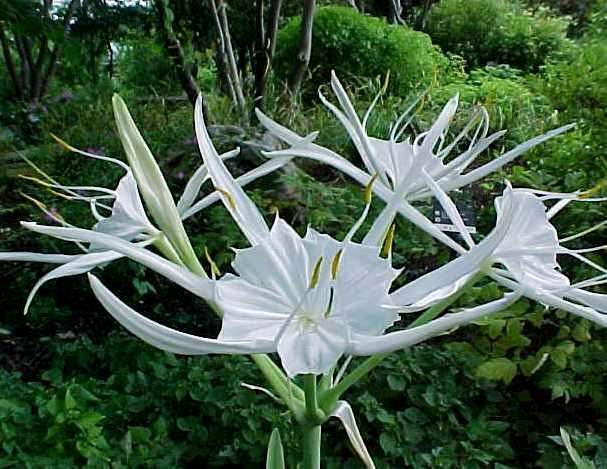 In common with all oriental and trumpet lilies, it is very fragrant. Orientals and orienpets (oriental x trumpet hybrids) typically flower mid to late season, usually mid June through mid-late July. They are tall, ranging from three to six feet or more. Due to their height, staking is recommended as the weight of their flowers can cause their stems to break, especially in windy or rainy conditions. 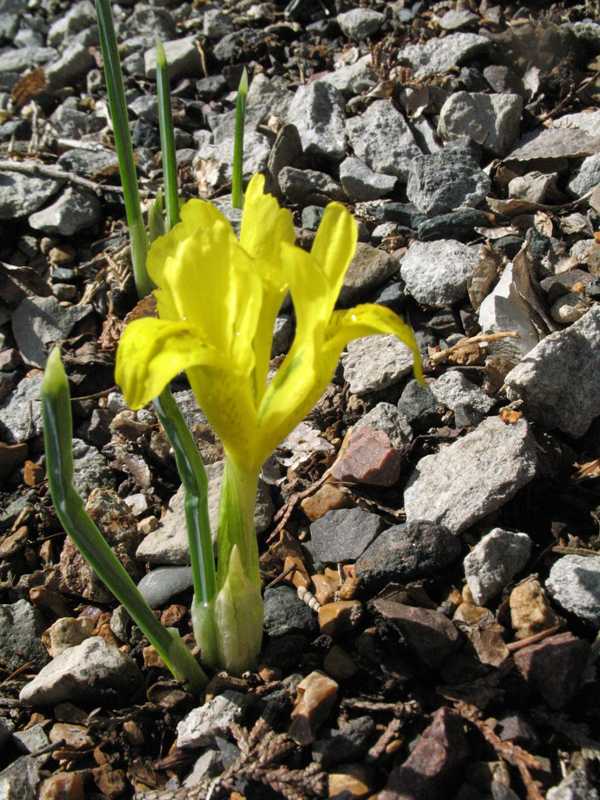 Tip: A small and inconspicuous preliminary indicator stake should be put out when the bulbs are first planted, about six inches away from the bulb. As the stems on the lilies begin to reach several feet, replace the indicator stake with a larger and strong bamboo or steel rod, and loosely tie the lily stem(s) to it in at least three places from the top to the bottom of the stem. By doing this you will reduce the risk of injuring the bulb, which over time can grow to the size of a large cantaloupe. All lilies make excellent companions to daffodils and other earlier spring-flowering bulbs, quickly concealing the spent flowers and foliage as they grow. Full sun in well drained moist soil. 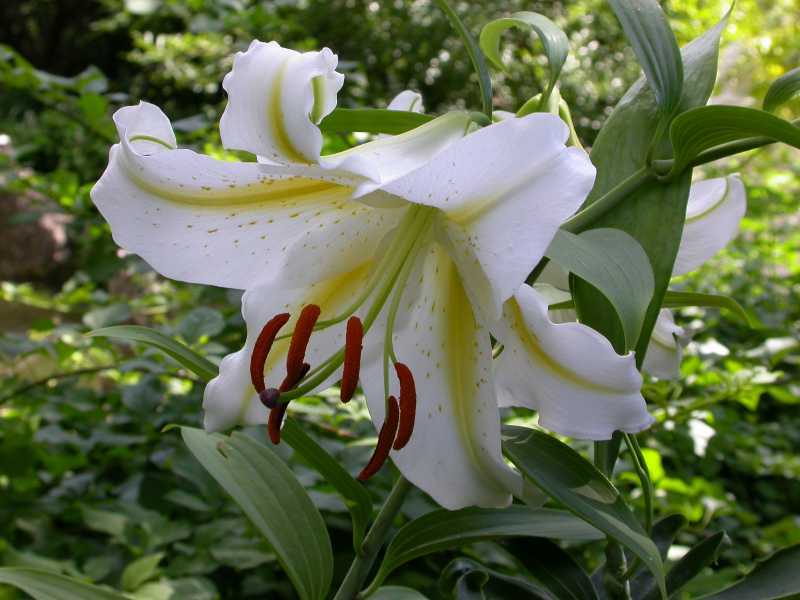 Unfortunately, lilies are desirable to animals, especially rabbits and deer. One of the better commercially available yellow varieties for its long-term perennial qualities and minimal maintenance requirements. Early blooming, usually by the first of June. Very prolific. Asiatic lilies are usually the first lilies to flower, starting in late May and continuing through June, and are one of the easiest types to grow. Reaching only ten inches to three feet in height, depending on variety, they rarely require staking. They have the greatest color spectrum of all lilies, and the commercially available selection is very large. Typically fast increasers, providing masses of flowers in just a few years. Most do not, however, have fragrance. All lilies make excellent companions to daffodils and other earlier spring-flowering bulbs, quickly concealing the spent flowers and foliage as they grow. For sun to partial shade, in well drained moist soil. Unfortunately, lilies are desirable to animals, especially rabbits and deer. A gorgeous and easy species trumpet lily of creamy white flowers with purplish-pink striping on the back side of the petals. One of the first of the trumpets to flower, usually in early June. Stems four feet tall.The heady fragrance of trumpet lilies can easily perfume an entire garden or indoor space with just a few flowers. They typically flower early to midseason, throughout June. They are tall, ranging from three to six feet or more. Each stem may have as many as thirty flowers. Due to their height, staking is recommended as the weight of their flowers can cause their stems to break, especially in windy or rainy conditions. Tip: A small and inconspicuous preliminary indicator stake should be put out when the bulbs are first planted, about six inches away from the bulb. As the stems on the lilies begin to reach several feet, replace the indicator stake with a larger and strong bamboo or steel rod, and loosely tie the lily stem(s) to it in at least three places from the top to the bottom of the stem. By doing this you will reduce the risk of injuring the bulb, which over time can grow to the size of a large cantaloupe. All lilies make excellent companions to daffodils and other earlier spring-flowering bulbs, quickly concealing the spent flowers and foliage as they grow. Full sun in well drained moist soil. Unfortunately, lilies are desirable to animals, especially rabbits and deer. All-white form of L. regale. The heady fragrance of trumpet lilies can easily perfume an entire garden or indoor space with just a few flowers. They typically flower early to midseason, throughout June. They are tall, ranging from three to six feet or more. Each stem may have as many as thirty flowers. Due to their height, staking is recommended as the weight of their flowers can cause their stems to break, especially in windy or rainy conditions. Tip: A small and inconspicuous preliminary indicator stake should be put out when the bulbs are first planted, about six inches away from the bulb. As the stems on the lilies begin to reach several feet, replace the indicator stake with a larger and strong bamboo or steel rod, and loosely tie the lily stem(s) to it in at least three places from the top to the bottom of the stem. By doing this you will reduce the risk of injuring the bulb, which over time can grow to the size of a large cantaloupe. All lilies make excellent companions to daffodils and other earlier spring-flowering bulbs, quickly concealing the spent flowers and foliage as they grow. Full sun in well drained moist soil. Unfortunately, lilies are desirable to animals, especially rabbits and deer. A rich all-orange trumpet variety. Four to five feet tall.The heady fragrance of trumpet lilies can easily perfume an entire garden or indoor space with just a few flowers. They typically flower early to midseason, throughout June. They are tall, ranging from three to six feet or more. Each stem may have as many as thirty flowers. Due to their height, staking is recommended as the weight of their flowers can cause their stems to break, especially in windy or rainy conditions. Tip: A small and inconspicuous preliminary indicator stake should be put out when the bulbs are first planted, about six inches away from the bulb. 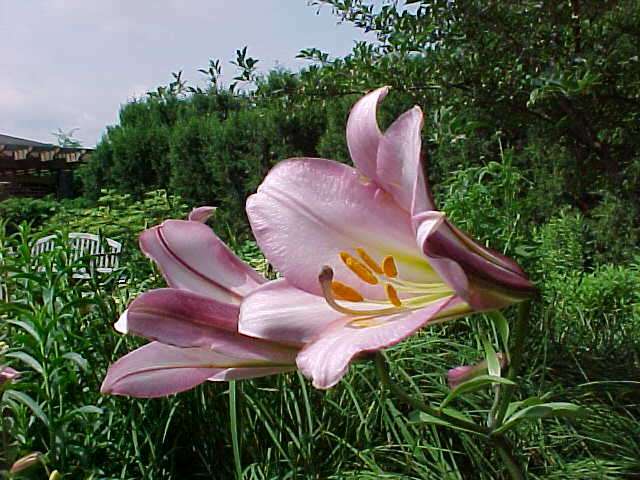 As the stems on the lilies begin to reach several feet, replace the indicator stake with a larger and strong bamboo or steel rod, and loosely tie the lily stem(s) to it in at least three places from the top to the bottom of the stem. By doing this you will reduce the risk of injuring the bulb, which over time can grow to the size of a large cantaloupe. All lilies make excellent companions to daffodils and other earlier spring-flowering bulbs, quickly concealing the spent flowers and foliage as they grow. Full sun in well drained moist soil. Unfortunately, lilies are desirable to animals, especially rabbits and deer. 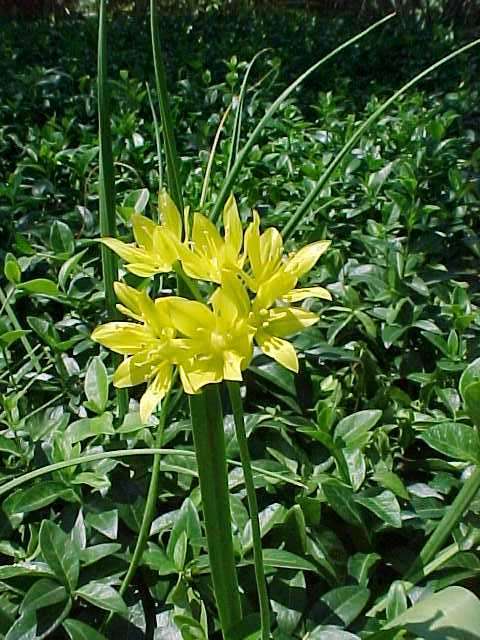 A very versatile perennial bulb that loves sun and tolerates any moist but well-drained soil type. Thrives in alkaline conditions. 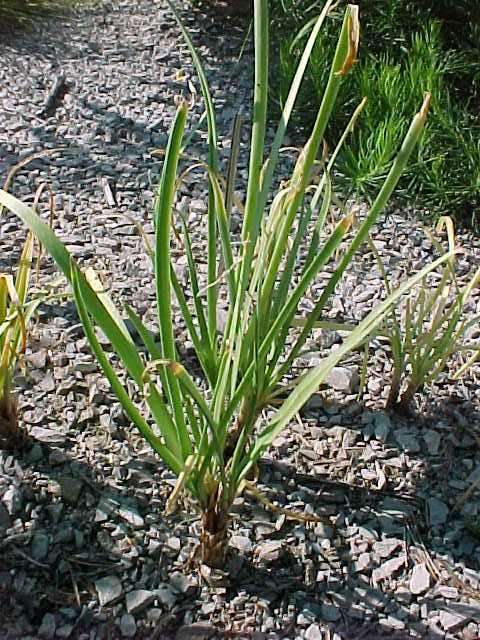 A very functional bulb: its foliage emerges in late summer to early fall, acting as an indicator for other dormant companion bulbs planted nearby. Many excellent hybrid forms are available, spanning the blue spectrum. Multiplies freely by division and seed. Animal resistant. A standard poeticus or pheasant’s eye daffodil (typically one flower per stem; petals white, cup disc-like and very small, usually yellow with a red rim; very sweetly scented; late April to May). Very late to flower in late-April-May, bringing the daffodil season to a close. Poeticus daffodils may take a year or two longer to settle in; once planted, do not disturb. They, like cyclamineus varieties, prefer moisture year round. Moist but well drained soil in sun to light shade. Animal resistant. The latest daffodil to bloom, guaranteed. A small-cupped daffodil (corona or cup not more than one-third the length of the petals) with white petals and a red-orange rimmed cup that blooms very late, usually in May. Excellent perennial. Super companions to late spring bulbs, camassias, late tulips, and alliums. Tolerates any well-drained soil in sun to light shade. Animal resistant. 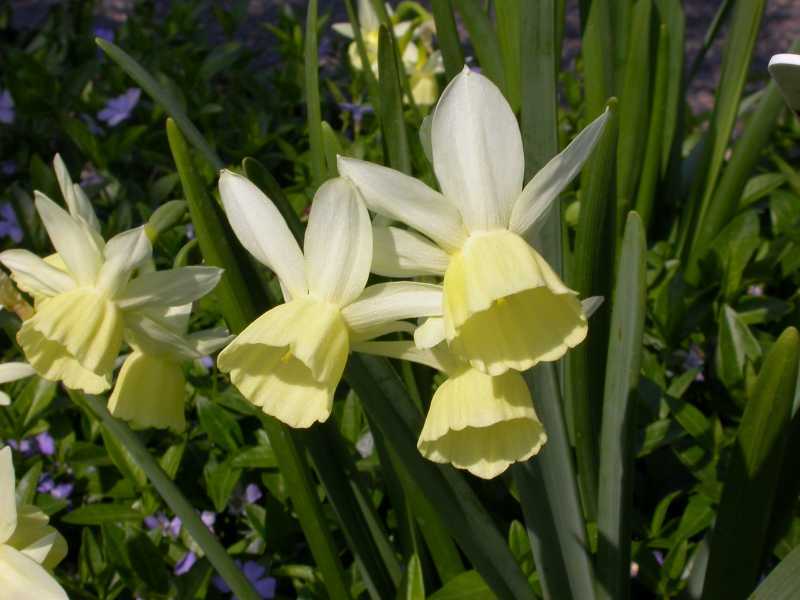 The best bicolor trumpet daffodil (corona or trumpet as long as or longer than the petals) commercially available. Very large flowers of white petals and golden trumpets of impeccable substance really stand out in the spring display and tolerate inclement weather far better than less superior commercial varieties ‘Las Vegas’, ‘General Patton’, ‘Goblet’, and ‘Magnet’. Later flowering (mid-April) and very long lasting. 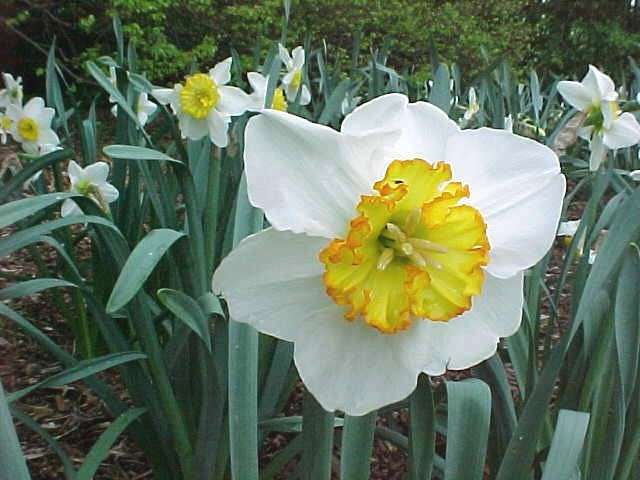 Superb perennial daffodil, increasing in number and bloom every year. Tolerates any well-drained soil in sun to light shade. Animal resistant. A double daffodil (clustered petals and cup, often with multiple flowers to a stem) perhaps best treated as an annual or indoor novelty. Beautiful but unfortunately often tender variety of daffodil in Saint Louis that even in the best circumstances will not perennialize as well as others. 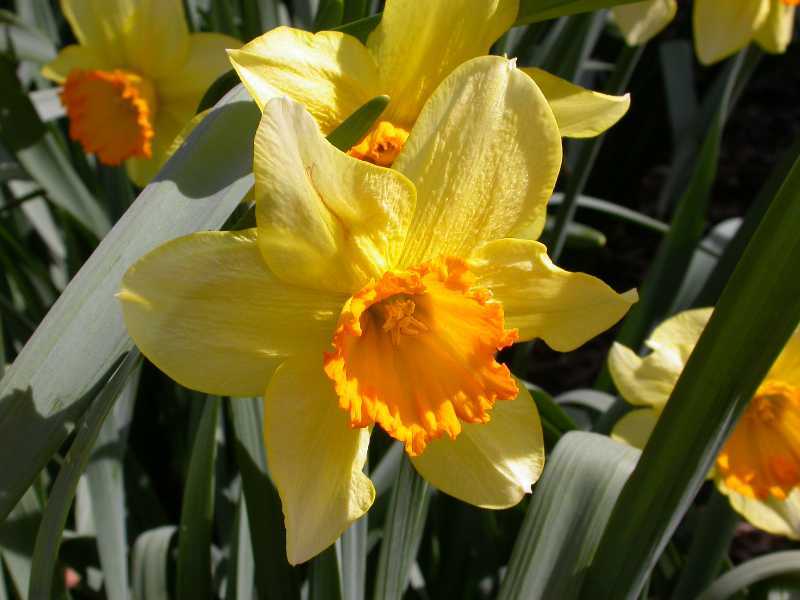 May be sold as a summer-blooming daffodil, as it can be easily forced to bloom at different times of the year. If planted in the ground in the fall, as an intended perennial, site it in a south-facing exposure, ideally against a house or other heated structure to reduce exposure. Its foliage may emerge in the fall and continue to grow during the winter; hard freezes will kill any openly exposed foliage, and, over time, weaken the plant to the point of death. Mid-season bloom in late March, multi-headed, strongly fragrant, white and yellow. Tolerates any well-drained soil in full sun. Animal resistant. 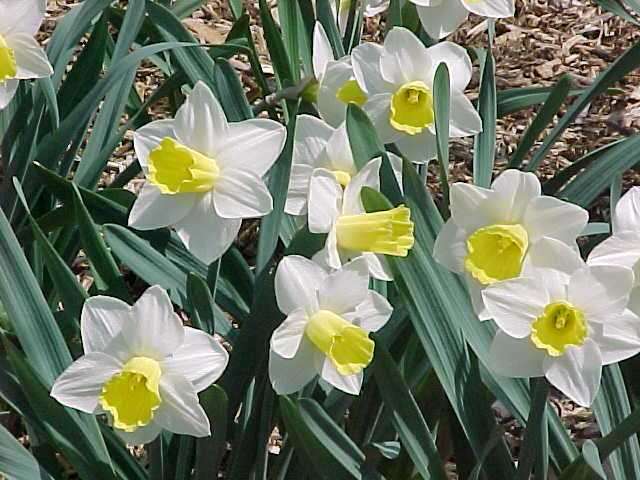 One of the best all-purpose large-cupped daffodils (corona or cup is greater than one-third but less than the length of the petals), and definitely one of the best long-term perennial varieties available with tremendous annual increase. ‘Ice Follies’ opens with white petals and a yellow cup that matures to white. Early flowering, in mid-March. Tolerates any well-drained soil in sun to light shade. Animal resistant. An excellent triandrus daffodil (multiple pendant flowers to a stem, with petals reflexing away from the blunt corona or cup). ‘Ice Wings’ needs a very well drained site for long-term perennial growth. 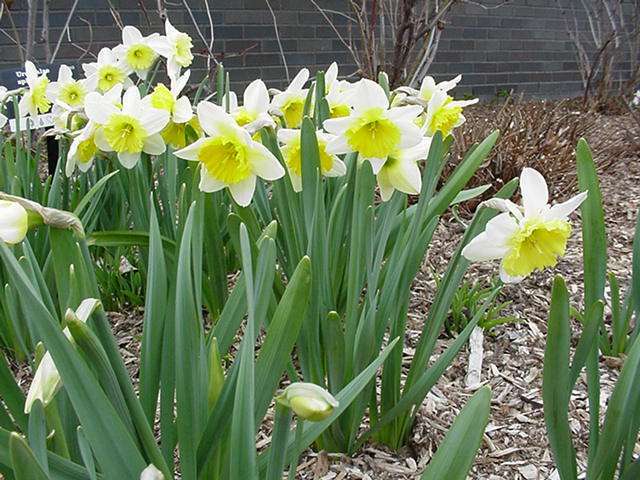 Unlike most daffodils, ‘Ice Wings’ cannot tolerate excessive moisture, even during growth. 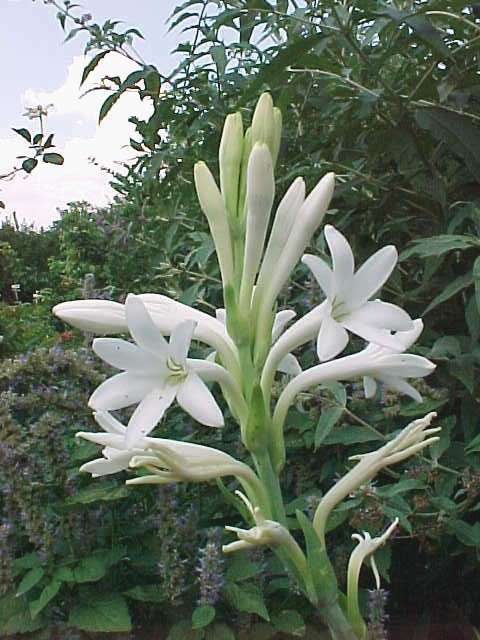 If very well drained soil cannot be provided, consider all-white ‘Thalia’ or ‘Tresamble’ instead. Sun to light shade. Animal resistant. A superb cyclamineus hybrid daffodil (one flower to a stem; petals are strongly reflexed away from short to very long corona or cup). Early blooming in early to mid-March with golden yellow petals and rich orange coronas. A floriferous variety that may produce several stems per bulb, thus providing several weeks of color. Varieties ‘Itzim’ and ‘Straight Arrow’ are also excellent yellow-orange cyclamineus. Unlike most daffodils that prefer a drying out during their dormancy period (summer to fall), cyclaminues daffodils prefer moisture throughout the year. Moist but well drained soil in sun to light shade. Animal resistant. A very early large-cupped daffodil (corona or cup is greater than one-third but less than the length of the petals) in bright yellow and orange, blooming very early, through March. A tall and robust variety that works very well as a landscaping type as it is a superb perennial, increasing in number each year. Tolerates any well-drained soil in sun to light shade. Animal resistant. Superb triandrus daffodil (multiple pendant flowers to a stem, with petals reflexing away from the blunt corona or cup) of light and darker yellow. Animal resistant. Tolerates any well-drained soil in sun to light shade. Animal resistant. A terrific, dwarf triandrus daffodil (multiple pendant flowers to a stem, with petals reflexing away from the blunt corona or cup) of all white. Blooms late season in mid-April to May, and is very sweetly fragrant. ‘Petrel’ will tolerate excessive moisture during its growth much better than other triandrus hybrids. 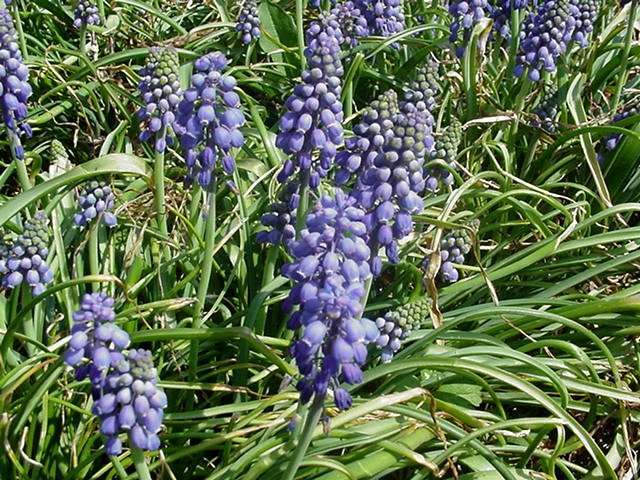 An excellent variety for the late bulb garden and rockery, and an excellent companion to the many selections of Muscari and Bellevalia. Tolerates any well-drained soil in sun to light shade. Animal resistant. One of the better pink-cupped jonquil daffodils (typically 2 or more very sweetly scented flowers to a stem) for the garden, vying only with ‘Bellsong’ for its soft pink colors. Each stem has multiple fragrant flowers of white petals and pink-edged yellow cups, blooming mid to late season in mid-April. 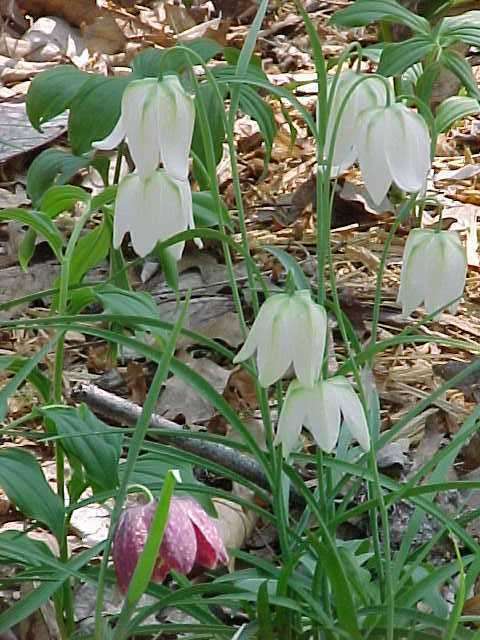 A floriferous variety that may produce several stems per bulb. 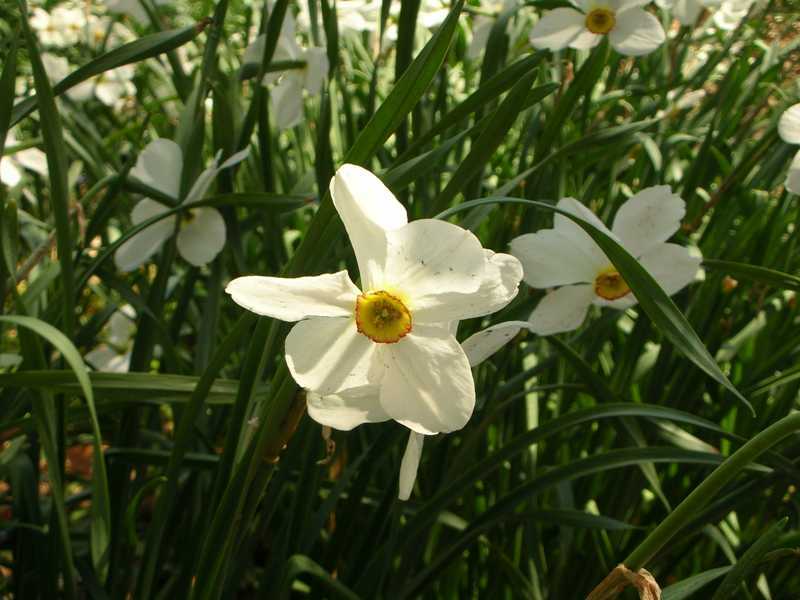 Will tolerate a wide range of soil types, but jonquils prefer a good drying out during summer. Tolerates any well-drained soil in sun to light shade. Animal resistant. 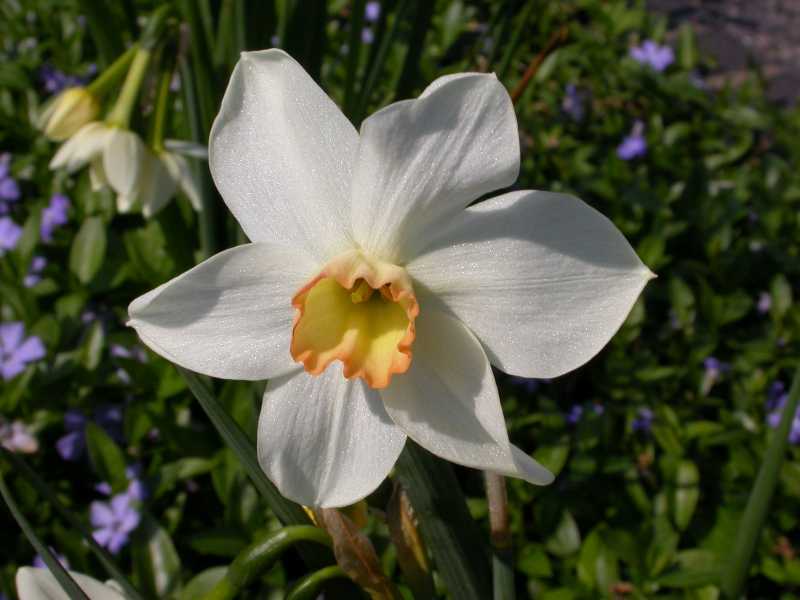 Excellent jonquil daffodil (typically 2 or more very sweetly scented flowers to a stem) for the garden and naturalizing. Sulphur-yellow petals with white cups, blooming mid-season in early April. 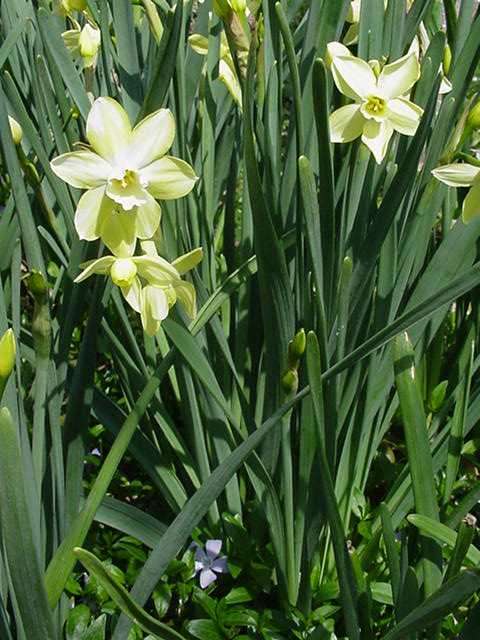 Will tolerate a wide range of soil types, but jonquils prefer a good drying out during summer. Tolerates any well-drained soil in sun to light shade. Animal resistant. 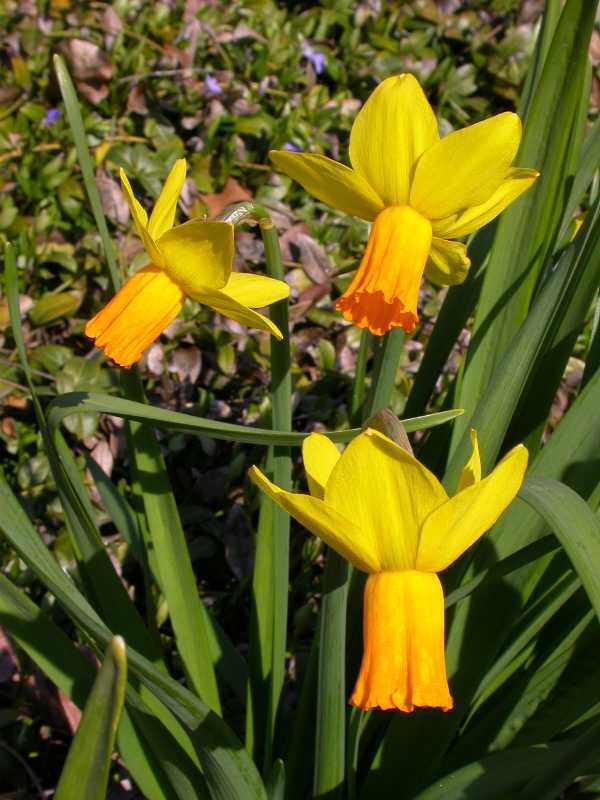 The best commercially available double daffodil (clustered petals and cup, often with multiple flowers to a stem). ‘Tahiti’ is virtually blast-proof, meaning that its flower buds do not succumb to spring’s notorious sudden heat waves and fail to open, as so many double varieties do (‘Golden Ducat’, ‘Albo-Plenus’, ‘Manly’). Mid to late flowering in mid-April, flowers are light yellow and orange; deeper yellow and strong orange-red in cooler seasons. Tolerates any well-drained soil in sun to light shade. Animal resistant. The world’s most common daffodil. Multi-headed, dwarf variety that is very early to flower. Will typically only have one to two flowers per stem after two or more years in the ground. Yellow petals and golden-orange coronas. Superb perennial variety in any soil in sun or part shade. Animal resistant. 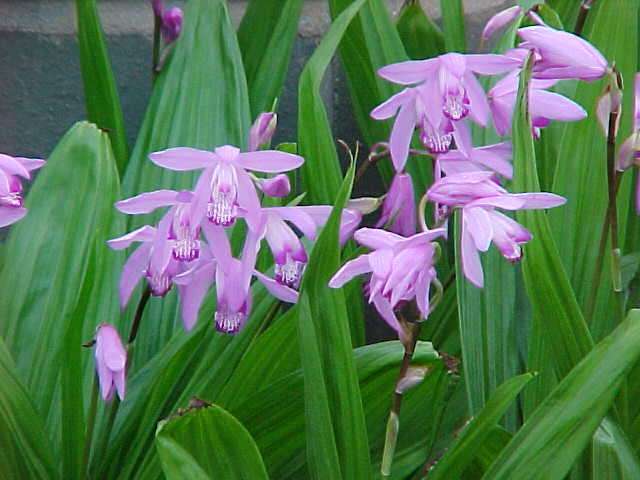 A favorite non-hardy summer- and autumn-flowering bulb for its ease in growing and its rewarding fragrance and charm. A desert native, this plant thrives in our summer heat; however, it really comes into its own in the fall, when the days are very warm and the nights cool, punctuated by heavy dews. 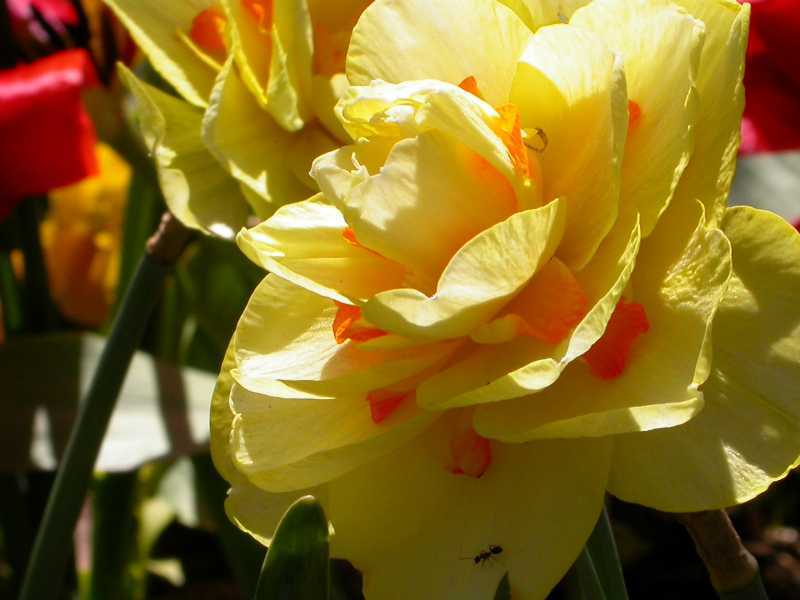 Though very easy, it may take a season or two to bulk up the bulbs to blooming size; typically those available are one year away from blooming. Potting up in late February or March to get a head start on the season (planted outdoors after the threat of frost) will give you a better chance of having an earlier and longer blooming season. Dig before a killing frost, and store in a warm, dark, and dry location over the winter. This, along with S. mischtschenkoana, is the easiest and most rewarding of the spring scillas. Very rich, deep blue fragrant flowers. Early flowering, in March to early April. Tolerant of any soil, though it prefers rich, moist, and slightly alkaline and organic conditions. Freely reproduces by seed and division. Animal reistant. Species tulip. Superb perennial choice for the rock garden, or any area with exceptionally well-drained soil; otherwise an annual. A unique apricot-yellow color that bronzes as the flowers mature. Blooms mid-March through early April. 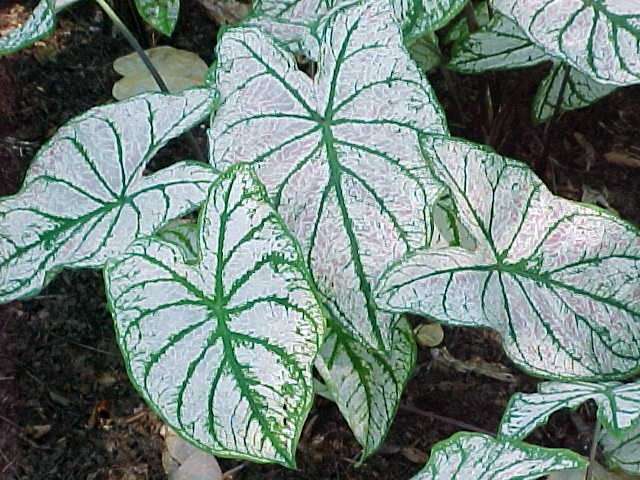 Beautiful, wavy, and glaucous foliage lies flat against the ground. Unfortunately not animal resistant; voles, mice, chipmunks, and squirrels love tulips as much as gardeners. A terrific addition to the non-hardy summer tropical bulbs. Chartreuse colored form that acquires gold shading with more sun; greener in more shade. Its broad, rugged, semi-upright leaves make an excellent contrast to the many other brightly colored summer bedding plants. Good for sun or shade in any moist garden soil. Rich soil and frequent watering encourages very large plants. Dig before frost and store indoors during winter.